This quilt was for us! The fans were created by hand. Many were sewn while waiting for rides in Disney World! My in-laws met us in Florida during one of our USA trips and took us to the theme parks. From previous visits, I knew the forever waits in some lines were maddening. Wearing a bun-bag full of plastic zip bags of pieces, I stood waiting, but busy. Have quilt pieces will travel! The blocks were sewn together (once finished) by machine. This was the first quilt I gave to someone else to quilt. Frankly after hand sewing all those fan pieces and curved seams and embroidering the edge of each, I was sick of the sight of it! Getting this back done was WORTH the cost! 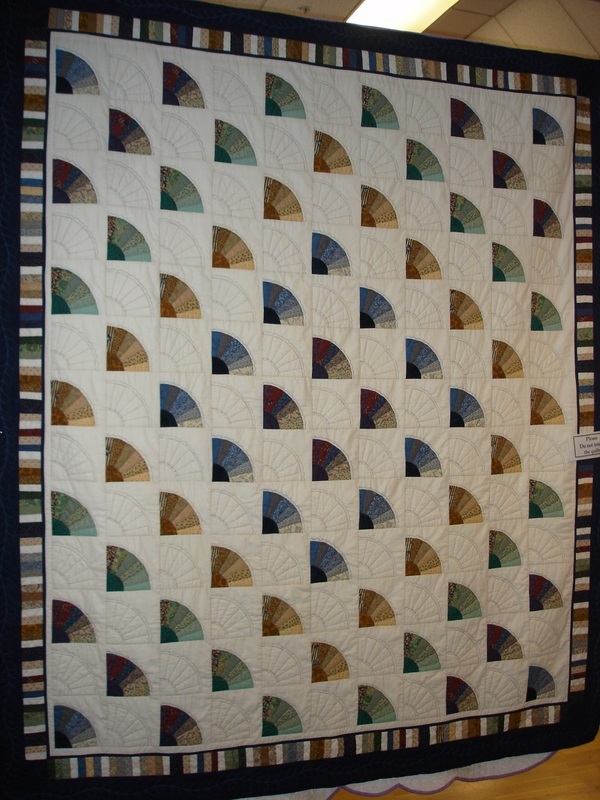 My friend Barbara Paton did a fantastic job machine quilting all those fans and recommending the border design. I couldn't be happier.